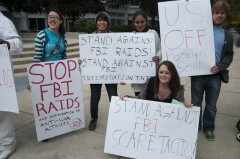 Milwaukee Rallies Against FBI Raids on Anti-War Activists | Fight Back! Milwaukee, WI - Students and community members held a rally in front of Milwaukee's Federal Building to protest the Sept. 24 FBI raids on anti-war activists in the Midwest and elsewhere in the United States. Members of a wide variety of community organizations showed their support, including speakers from the Latin America Solidarity Committee, International Action Center, AFSCME local 82 President Gilbert Johnson, and Milwaukee Graduate Assistants Association (MGAA) Co-president Lee Abbott. Student speakers included Students for a Democratic Society (SDS) in Waukesha and Milwaukee, as well as the Chicano organization MEChA. "I personally went to Chicago with other activists to give support to those whose homes had been raided," UW-Waukesha SDS member Chance Zombor said, "Tensions were high, and the victims of the raids were shaken. "But, if the FBI thinks they're going to intimidate us into silence, they're wrong," Zombor added. Notable speaker was Natasha Morgan, a member of Freedom Road Socialist Organization, MEChA, and SDS, who found herself bombarded by phone calls and messages from the FBI that lasted from the morning of Sept. 24 until the afternoon. "I received eight calls from 10:00AM to 2:00PM from agents who wanted to meet with me," Morgan said. "Solidarity action with student and labor activists who are being murdered in Colombia is not criminal. We work to share their stories." Attendees expressed general outrage at the government's actions. "I was shocked that the FBI would invade the homes of people who are trying to help oppressed peoples around the world," student Greg Greenya said, "The event had a lot of support from those witnessing it. The message was clear: We will not give in."